Coexistence of cancer and tuberculosis in axillary lymph nodes is rare. Only seven cases have been reported in the literature. We report here a case of infiltrating ductal carcinoma breast metastasizing to the axillary lymph node along with tubercular granuloma in the same lymph node without primary mammary or pulmonary tuberculosis. Primary tuberculosis coexisting with carcinoma is of rare occurrence. A possibility should always be borne in mind especially in patients from endemic areas. The synchronous occurrence of tuberculosis and carcinoma is unusual and association of the two has baffled surgeons and physicians for over two centuries. Coexistence of tuberculosis and metastatic carcinoma in axillary lymph nodes, without pulmonary or mammary tuberculosis is even rare. 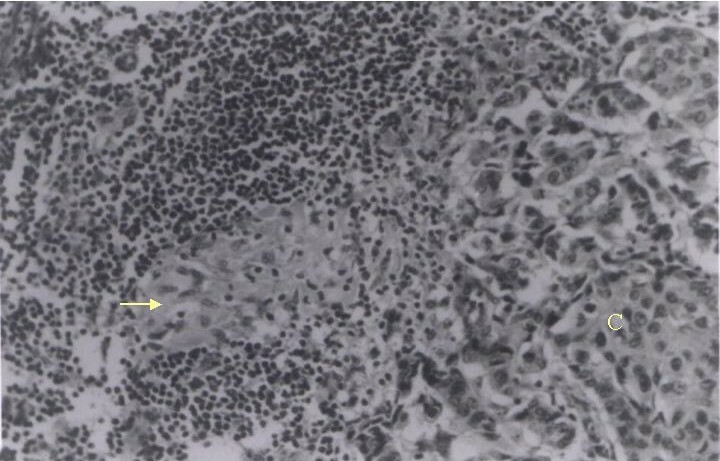 Warthin (1899) first described the coexistence of tuberculosis and cancer in axillary node , five other cases have been reported between 1902 and 1992 [2–4]. A 52-year-old postmenopausal lady presented to the out patient clinic at Regional Cancer Centre, Trivandrum with a breast lump of 8 months duration. Examination revealed a 3 × 2.5-cm well-defined hard mass in the upper inner quadrant of left breast. There were no palpable nodes in the left axilla. Contralateral breast and axilla were normal. There were no supraclavicular nodes. Biochemical parameters and chest roentgenogram were normal and metastatic work-up was negative. Fine needle aspiration cytology revealed malignant cells. A modified radical mastectomy was carried out. Histopathology of the resected specimen revealed grade III infiltrating ductal carcinoma. 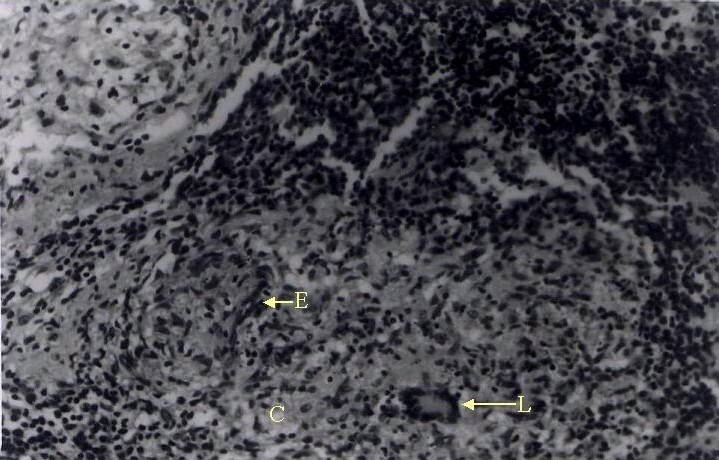 Two of the axillary lymph nodes revealed metastatic carcinoma and granulomatous foci (figure 1) with Langhan's giant cells (figure 2), no acid-fast bacilli (AFB) could be demonstrated in the granuloma. The tumor was negative for estrogen and progesterone receptors. Post operatively patient received short course, four drug anti tubercular treatment and six cycles of adjuvant chemotherapy with cyclophosphamide, methotrexate and 5-flurouracil (CMF) followed by adjuvant radiotherapy to the chest wall and supraclavicular fossa. Patient is disease free after eight months of follow-up. The association of tuberculosis and cancer has been recorded in most of the organs and has been described and explained by many authors in many diverse ways. Kaplan et al. (1974) reviewed 58,245 patients with cancer and identified 201 cases of coexisting tuberculosis . Highest prevalence was seen in patients with Hodgkin's disease (96/10,000 cases) followed by lung cancer (92/10,000), lymphosarcoma (88/10,000) and reticulum cell sarcoma (78/10,000) . Among 14,742 cases of breast reviewed by them, only 28 had coexisting tuberculosis in breast, a prevalence of 19/10,000. No case of axillary nodal coexistence was identified in their series . Bayle first described the association of tuberculosis and carcinoma in 1810. He described "cavitation cancereuse" as one of the six types of tuberculosis, which appears to be the first published description of coexistence of the two . The coexistence of breast cancer and tuberculosis has been described in over 100 cases [7, 8], however its coexistence in the axillary node is rare. Only seven cases have been reported in the literature so far [2–4]. Majority of these cases reported breast cancer with axillary node showing tubercular foci, while our patient had a metastatic carcinoma and tubercular granulomatous foci in the same lymph node in the same high power field (figure 1) with the absence of tubercular foci elsewhere. The case is being reported for its rarity.